Community pharmacists across Tasmania stand ready to contribute to the fight against meningococcal by administering the vaccine under the plan announced by the State Government All Tasmanians under the age of 21 are eligible to receive a free menigococcal vaccine against four strains (A, C, W and Y). Pharmacists who have undergone the DHHS training are are able to provide the vaccine to children aged 10 years and older. 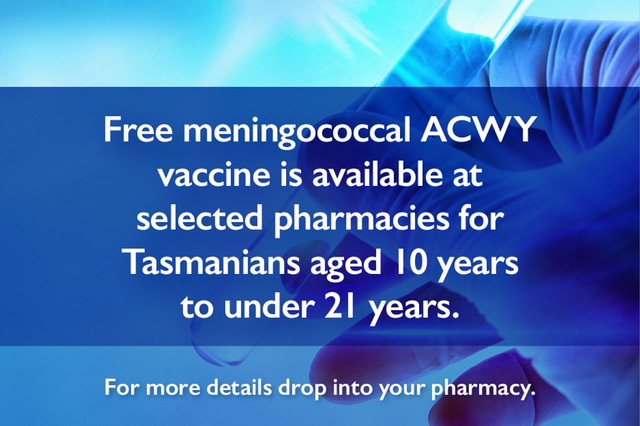 To find out your nearest pharmacy providing free menigococcal ACWY vaccinations, download this list. To access further information download the DHHS meningococcal fact sheet.